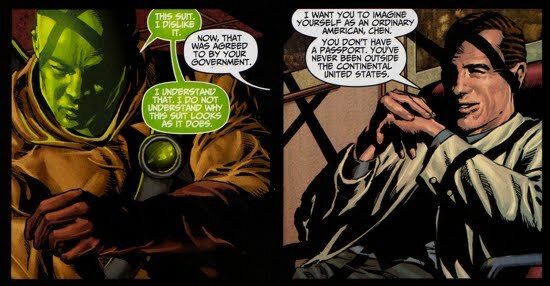 Norman Osborn, now a completely legitimized agent of the U.S. government, made it his personal goal to lead the Thunderbolts team to success within Tony Stark's Initiative. The Thunderbolts' mandate was to detain unregistered superhumans that are acting in violation of the law. Heroic acts of vigilantism by unregistered combatants were no longer tolerated by the C.S.A. (Commission/Committe on Superhuman Affairs/Activities) and the Thunderbolts were deputized as a deterrent to such activity. The team's superhuman targets were provided to them by the C.S.A., so Norman did not have full veto power over who the team would arrest. 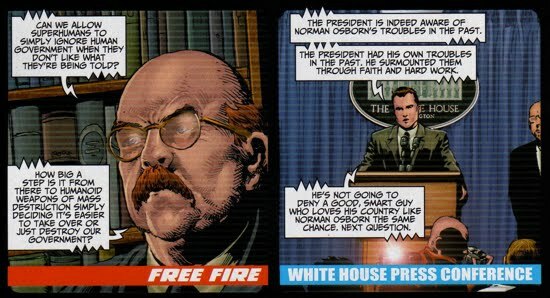 As the Director of the Thunderbolts program, Norman participated in various conflicts throughout the Marvel Universe. However, his team's initial orientation and their first official mission were featured in Thunderbolts #110-115 in a story arc called Faith in Monsters. As a part of the enrollment process into the Thunderbolts program, each team member took part in an initial interview given by Osborn. During these meetings Osborn explained the candidate's role within the team, their compensation, and the rules to which they are expected to abide. 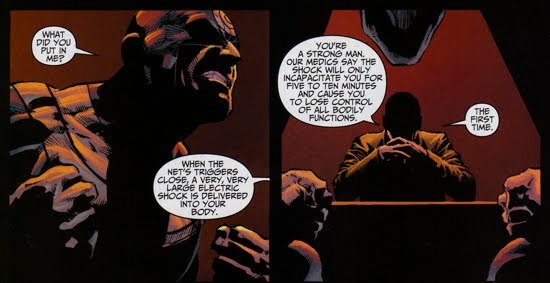 Bullseye's initial interview was featured in Thunderbolts #110, and during that interview he was informed that his body was chock full of "a net of nanometer-sized generators, receivers, triggers, and wires". These devices served as an electro-shock restraint to keep Bullseye on a metaphorical (and literal!) leash. 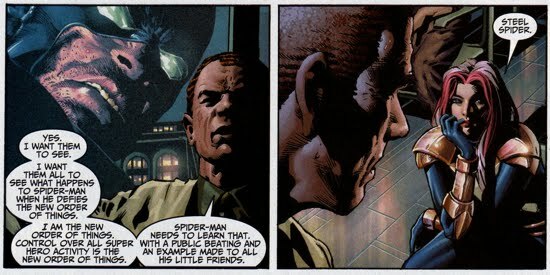 Osborn then explained to the assassin that if he remained compliant and served the team's goals, then at the end of his 'tour of duty' Bullseye would receive a hefty sum of money as well as a new identity. Bullseye signed on with Osborn. 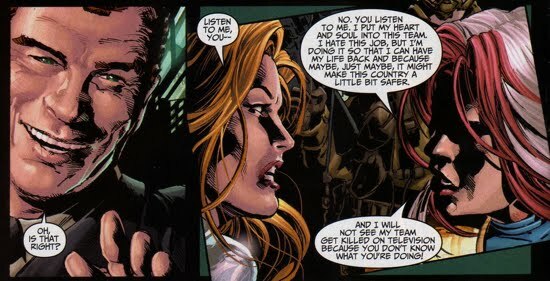 Soon after his meeting with Bullseye, Osborn was interviewed by a TV news reporter and the former Green Goblin gave thanks to Tony Stark for offering him this chance at redemption. He even acknowledged his 'troubles in his past', a rare occasion for Osborn to admit culpability publicly. Osborn then conducted his initial interview with his new field team leader, Dr. Karla Sofen (aka Moonstone). Norman demoted the former team leader, Melissa Gold (aka Songbird), in favor of Sofen because the latter had "neither morals, nor ethics". Moonstone, though flattered, was not interested in being a member of the Thunderbolts and it was not until Norman informed her that she would be allowed to keep her moonstone that she agreed to sign on to the initiative. The $1 million a month pay didn't hurt either. 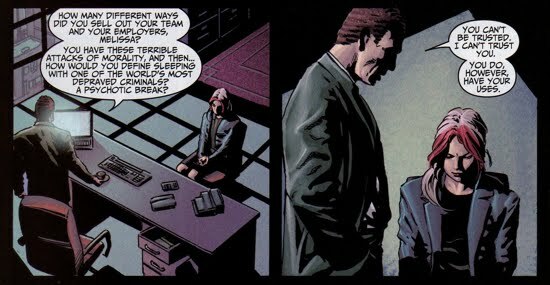 In Thunderbolts #111, Osborn carried out his initial interview with Songbird and he delivered the bad news that she will no longer be the team's field leader. Songbird was very upset by this roster change and, ironically, Osborn claimed that she was demoted because of her poor moral and ethical code (she had slept with Baron Zemo). Talk about a double standard! Gold, like Bullseye, would receive a new identity once she successfully completed her tenure on the Thunderbolts. As Osborn's new team began to take form, they received their first target from the C.S.A., Jack Harrison (aka Jack Flag). Flag, who was operating out of Cleveland, Ohio, quickly found himself under attack by the new-look Thunderbolts. However, Osborn's team lacked a cohesiveness and Flag was able to evade them and nearly escape. Unfortunately for Jack Flag, Bullseye, with the aid of a cloaking device, was able to catch the vigilante off-guard and paralyze him. News cameras filmed the team's bumbling, but did not catch Bullseye lethal use of force. Moonstone was able to swing the story so that Penance received the credit for detaining Jack Flag. Osborn watched the news coverage from his office at Thunderbolts Mountain and he was none-too-pleased with the team's ineptitude. However, Osborn's brooding was soon interrupted by his secretary who read him a new list of tentative targets. Among that list was the name Scarlet Spider and Osborn, for a brief moment, was convinced she had said Spider-Man. The seemingly confused Osborn returned to his desk and took a dose of his prescription medication. Norman is seen taking (at least) two different medications Tegretol (anticonvulsive) and Lithane (for bipolar—manic/depressive disorder), so its pretty clear that Norman's mental state is rather delicate. That's quite an endorsement. It's interesting to note that the prior administration was also leery about Osborn, especially since the incoming President would have his concerns as well. 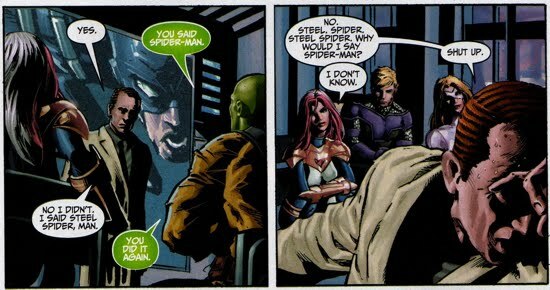 Osborn continued to keep watch over his team members, notably Venom and Bullseye, but soon he received confirmation on the team's next target: The Steel Spider (aka Ollie Osnick). 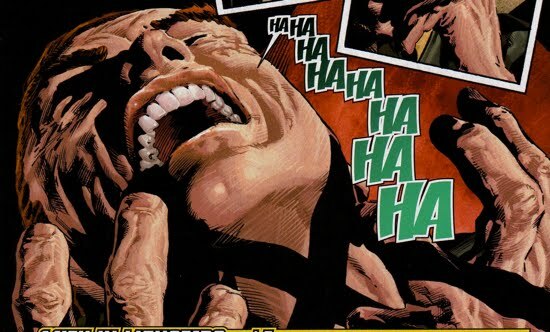 The news of a spider-related target sent Osborn (once again) down a spiral of uncontrollable laughter as he envisaged an attack on Spider-Man! In Thunderbolts #113, Norman continued his vigilance over his team and his concern for Penance (aka Bobby Baldwin) continued to grow. A self-crucified loner, Baldwin appeared to be sinking deeper into a pit of despair. 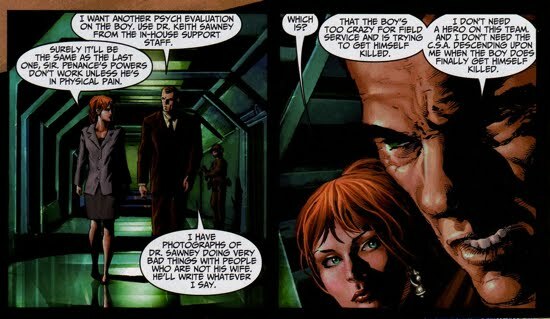 Fed up with Baldwin's antics, Osborn decided to request the services of their staff psychologist, Dr. Keith Sawney, for further analysis on Baldwin. Osborn had dirt on Sawney and felt that he could manipulate him in to writing a report on Baldwin that would deem him unfit for field duty. Soon after, Osborn bumped into The Swordsman (aka Andreas Strucker) in the Thunderbolts Mountain hallway. 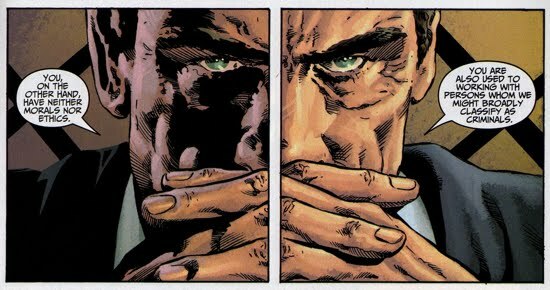 Strucker and Osborn did not mince words and their conversation became aggressive immediately. Strucker demanded an update on the regeneration process of his recently deceased twin sister. 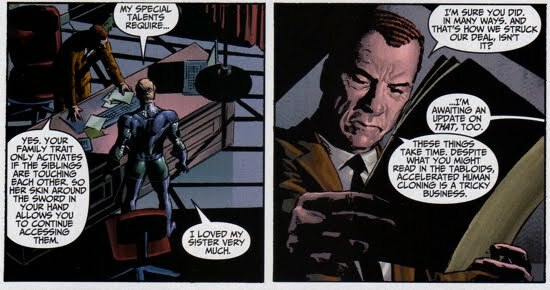 Osborn deflected Strucker's concerns and stated that 'accelerated human cloning is tricky business'. An interesting comment coming from the mastermind of Spider-Man's infamous Clone Saga. Norman tried to appease The Swordsman by informing him that his sister should be ready by the time Strucker's tour with the Thunderbolts ended. Interestingly, Moonstone caught Strucker storming out of Osborn's office and decided to make an ally out of him. Moonstone shared two interesting bits of information with Strucker. First, she confessed to tampering with Osborn's medication, making it so that he intermittently took a placebo within his regimen. 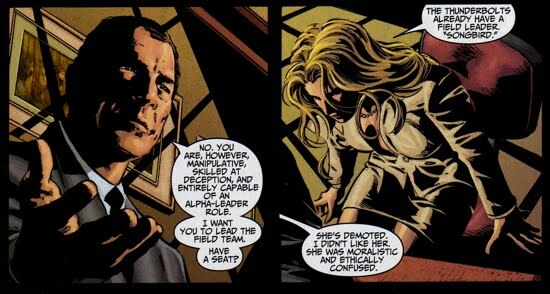 Second, she told Strucker that she's conspiring against Osborn so that she could become the Director of the Thunderbolts. Later, Osborn gathered the team together to brief them on their next target, the Steel Spider. 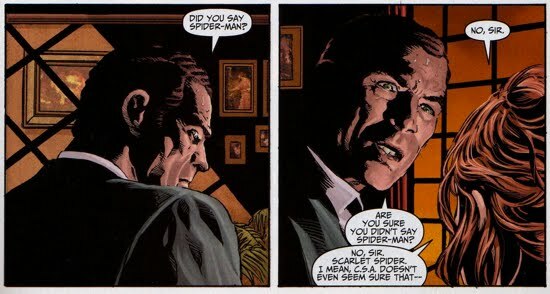 During the meeting, Osborn once again issued a Freudian slip when he mixed up Steel Spider and Spider-Man a handful of times. Osborn's Thunderbolts began to lose a little confidence in their leader (if they had any to begin with), regardless, Osborn sent the team to Phoenix, Arizona to accost Osnick. When the Thunderbolts tracked down the Steel Spider in Thunderbolts #114, Jillian Woods (aka Sepulchre) and Jason Strongbow (aka American Eagle) aided Osnick against the Thunderbolts. In the ensuing conflict, Venom bit off the Steel Spider's arm whilst Moonstone sustained a serious injury courtesy of the American Eagle. With Moonstone reeling from her injury, Songbird seized the opportunity to lead the team in the field. Thunderbolts #115 featured the conclusion to the Faith in Monsters story arc, and it continued where the previous issue left off...right in the middle of a heated battle between the Thunderbolts and the three vigilantes. 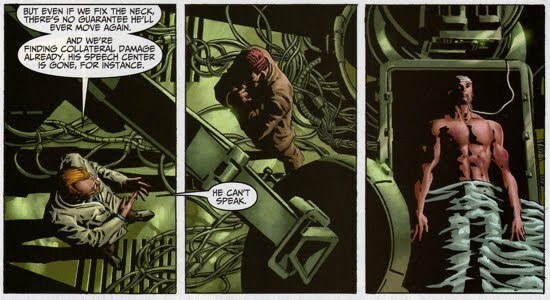 During the melee, Songbird (using a sound-wave technique that allowed her to speak to a single person) told Bullseye that his nanochain restraint had been disabled and that he was free to escape. It was unclear whether or not Bullseye realized that it was Songbird who was deceiving him, the tension between the two Thunderbolts would gradually build and eventually resurface down the road. Regardless Bullseye believed the voice in his head, so he killed his two handlers and then went after American Eagle. Moonstone, realizing that Bullseye was operating without his handlers, ordered his nanochain to be fired, which incapacitated him. At the time Bullseye was in the midst of a slugfest with American Eagle, and the firing of the nanochain allowed the American Eagle to brutally injure him. Bullseye sustained serious brain trauma and was temporarily paralyzed after the incident. 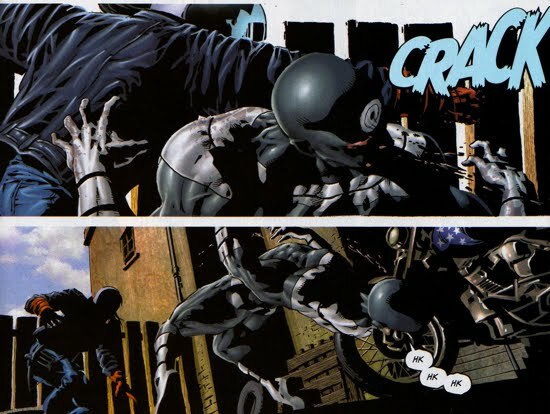 After the Steel Spider's arm was removed, he was easily taken into custody but both American Eagle and Sepulchre were able to escape Osborn's Thunderbolts. Overall, it was a bittersweet opening round for Osborn's Thunderbolts as the conniving and double-crossing seemed to increase exponentially throughout the team. An interesting side note to this initial Thunderbolts story arc involves Norman and his medication. After the infamous Gathering of Five ritual that left Norman completely insane, the work of Dr. Albert Bendix enabled Norman to recover and regain his sanity. Bendix placed the medication on a dermal patch and Osborn was back to his old self again (as scary as that is). In the beginning of this arc Norman is shown to be taking both Tegretol (anticonvulsive) and Lithane (for bipolar—manic/depressive disorder), much different from Bendix's prescription. Moreover, in Thunderbolts #128 Dr. Leonard Samson (aka Doc Samson) diagnoses Norman's mental state (see panel to the right for specifics). Pretty insightful diagnosis, I wonder if that would have gotten him prescriped Tegretol and Lithane? 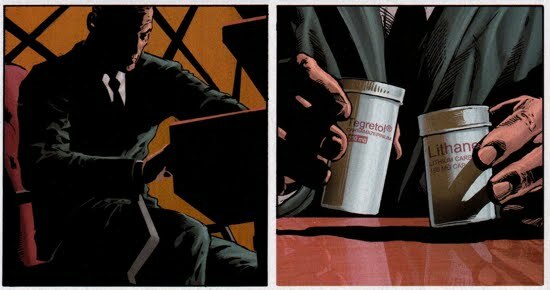 (first panel above): Dr. Albert Bendix creates a cocktail of meds to help restore Osborn's sanity. The initial concoction was dosed intravenously.